It's now fall, and I am looking forward to a break from the summer heat. Warm days are really nice, but hot days are not so nice. When it's hot enough, we want to stay inside. Interestingly enough, wildlife avoid really hot days as well. Alternately, and just like us, wildlife are less active when it's cold. However, fall is not summer, and it's not winter. It's an in-between time. So, fall can still have many days of warm weather. During fall, backyard habitat, woodlands and other wildlife habitat are still very busy places. Fall weather in cooler climates doesn’t put plants and wildlife to sleep like many believe. In fact, some plants and animals are busier than ever. The closer it gets to winter, the more time some animals spend getting ready for it. Other than just packing in calories, from berries, seeds and flowers, wildlife are also finding food to store. Many mammals, birds and insects store food, and having the right fall plants to provide diverse food sources, as well as cover, keeps your habitat stocked with what they need. 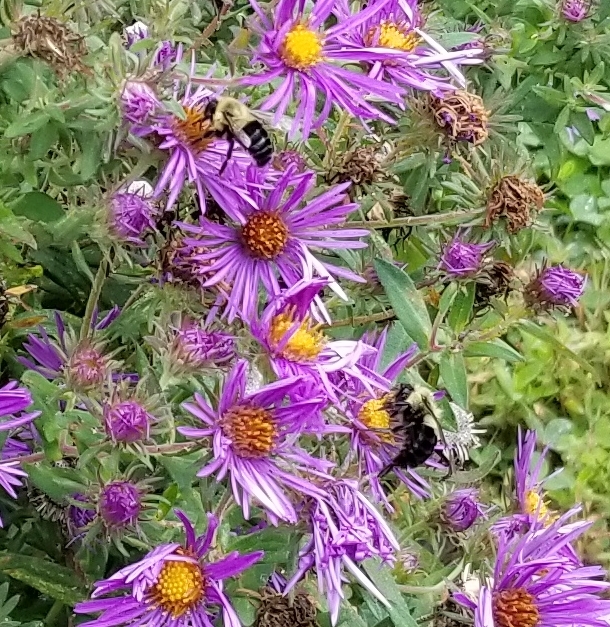 The following common, native plants provide food, cover and nesting opportunities for wildlife like bees, birds and mammals throughout the fall season. Before we cover specific plants, let’s briefly discuss whether you’re including the right types. Wildlife need the same things from their communities that we do from our respective human communities. If you want wildlife to stick around, move in and bounce back when things go wrong, they must have food choices, safe places and the ability to get to these things. So, make sure wildlife have different habitat layers (e.g. trees, shrubs, grasses and wildflowers) and diverse food choices within those layers. We’ll cover habitat structure in a different article, but keep this principle in mind when you’re improving or designing your habitat. Yes, there are many fall blooming wildflowers, and they offer wildlife great habitat and food choices. We appreciate wildflowers mostly because of their beautiful bloom and their ability to attract butterflies and bees. However, wildlife like birds and mammals also eat their seeds during fall and early winter. Also, insects will sometimes use wildflower stems to overwinter or lay eggs in. 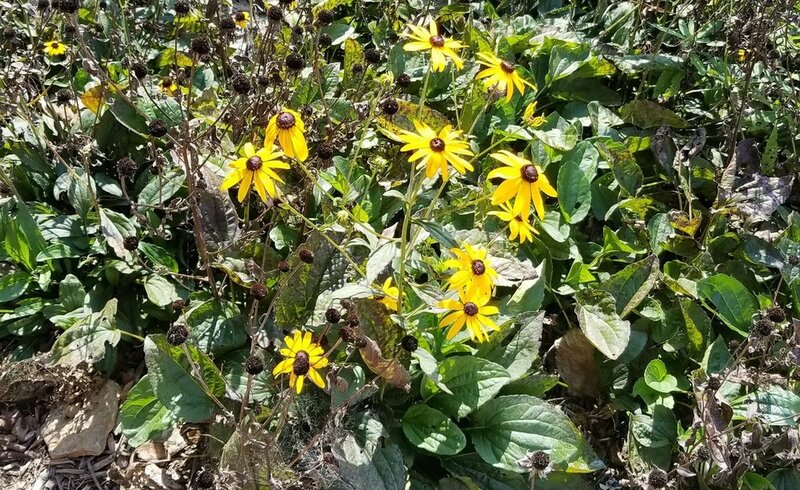 Fall bloomers include black-eyed susans, New England aster, sunflowers, and goldenrods. Seeds for each of these plants are easy to find, and black-eyed susans are common in garden centers during the summer. Practically any native, warm-season grass is a good choice if you have dry to moist habitat. Being native matters, because most non-native grasses can hurt wildlife habitat. Warm-season grasses reach their peak growth during the warmer parts of the year and are providing great food and cover options by fall. Grasses give you lots of options regarding size, sun to part shade tolerance, and dry to moist soil tolerances. Add sedges (not grasses, but similar) to your mix, and you now have more choices for wet habitats. Grasses, like wildflowers are fall food sources for bees, birds, elk and everything in between. The base of native grasses is used as cover for birds, small mammals, and even overwintering bumble bee queens. Some insects will even use the inside of grass stalks to overwinter, and larger mammals will bed in clumps of native grasses. Common native grasses include big bluestem, little bluestem, Indian grass, switchgrass, and muhligrass. After establishment, these grasses can provide cover nearly all year. Native grass seeds and some plugs are very easy to find, but larger potted plants aren’t as common. You are most likely to find switchgrass or muhligrass varieties in garden centers. You probably see a trend with these plants providing food, cover, and overwintering sites. Shrubs provide the same benefits as other types of plants, but they offer different options for cover, because they have a canopy for animals to hide and nest in. 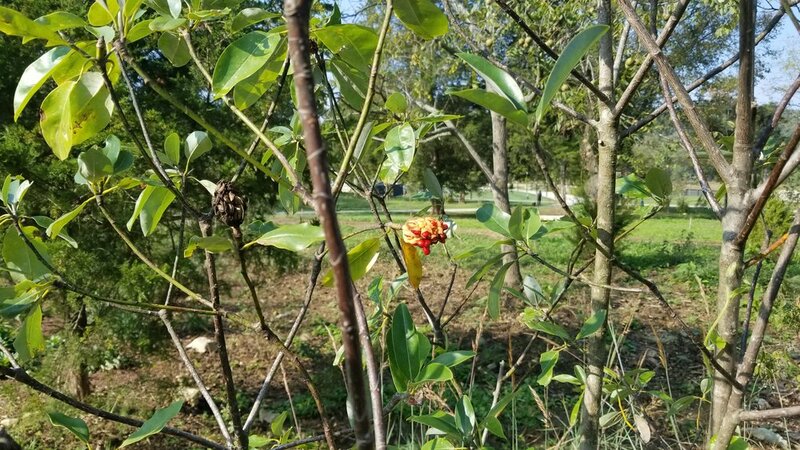 Fall fruiting shrubs can include winterberry holly, dogwoods (there are several), sumacs, common witchhazel, waxmyrtles (aka. bayberry) and eastern Viburnum species (e.g. arrowwood, blackhaw, nannyberry). Native shrubs are easy to find, but you may not always have many choices in small garden centers. Many can be started easily from seeds, and they are a dime a dozen at spring Arbor Day and reforest events. Trees offer an enormous amount of resources compared to other types of plants. Not only do they fruit and flower, but animals of all types use trees for all kinds of habitat needs. Leaves and twigs are eaten by insects and mammals, some insects even require trees to lay eggs in. Also, mammals, birds, and insects (including bees) will nest in dead and live trees. 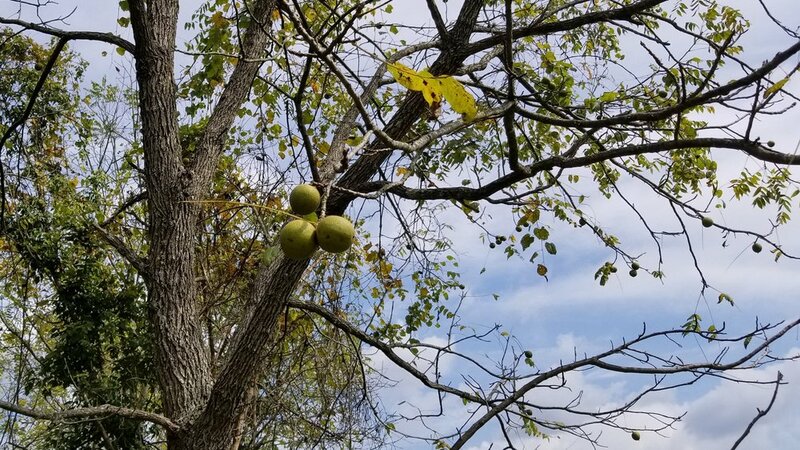 Fall fruiting trees include soft mast (soft fruit) species such as persimmon, eastern red cedar, black gum, magnolia, hackberry and American holly and practically any hard mast (hard fruit) species like oaks, hickories, pecans, walnuts, beech, hazelnut and pines. Trees, like wildflowers, are one of the easiest types of plants to find. They can be ordered from nurseries, started from seed and lots are available at Arbor Day and community reforest events. Occasionally, you can find some of the species that I listed at garden centers. Remember, great wildlife habitat is a busy place in the fall. Use native species layered at different heights, and plant diverse species within those layers. Backyard or back forty, these principles apply no matter how big or small the habitat and no matter what type of wildlife you care about. Birds and butterflies? Deer and quail? Bees and beetles? Check, check, and check.